Tickets sold in advance for an upcoming documentary about K-pop boy band BTS' ascent to global fame have passed the 100,000 mark, data showed Sunday. 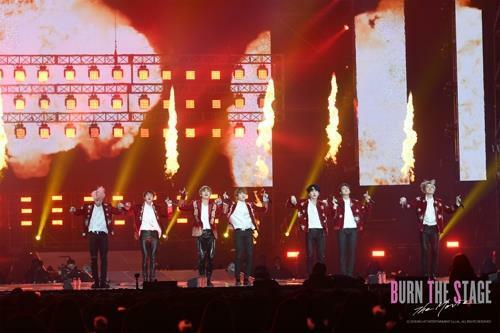 According to data compiled by the Korean Film Council, "Burn the Stage," set to be released Thursday in the domestic market, ranked No. 1 on the chart based on the ticket reservation rate, which is at 26.8 percent. This was followed by "Bohemian Rhapsody" with 21 percent and "Fantastic Beasts: The Crimes of Grindelwald" with 20.4 percent. The documentary features the septet's "2017 BTS Live Trilogy Episode III: The Wings Tour," which took the band to 19 global cities to captivate some 550,000 fans during a 300-day journey. The film was previously released on YouTube Premium, a paid streaming subscription service by YouTube, in a series of eight episodes from March to May. Copyright Herald Corporation. All Rights Reserved.